Climate change and the destruction of natural habitat is affecting bird migration and breeding patterns. Well … that’s about it. Seriously though, this book provides a great deal of research to back up what most of the intelligent population already believes. There isn’t anything too surprising here. If you are already a bird watcher or take an interest in environmental concerns, you probably already have a pretty solid idea of what is happening on our world. Author George W. Cox puts some numbers to the data and offers up some possible explanations for the changes he describes, as well as a few (though not too many) conclusions. Cox is thorough and I greatly appreciated that he looked at this globally (as the title suggests) rather than just for a single country or even continent. But Cox is not particularly engaging. The book reads like a dry doctoral dissertation. Even a high school text-book has more charisma. Climatic change, due to greenhouse warming and human modification of tropical forests and other natural communities, also poses a serious threat to other altitudinal migrants. Warming of tropical lowlands, together with forest clearing, may alter physical and biotic conditions of low elevation areas used by altitudinal migrants in the non-breeding season. And he so carefully explains things sometimes that you might wonder why he even brought it up. In North America, the ranges of some species have shifted, the population of some species have increased and others decreased, and migration schedules and breeding seasons of a few species have changed. Another quite different morphological feature, egg size, may also be related to climate change. The size of eggs of the European Pied Flycatchers nesting in northern Finland increased over the period from 1975 to 1993. This increase was positively correlated with increasing temperatures during the egg-laying period and also with increasing hatching success. Whether this represents a genetic change or a phenotypic response somehow related to warmer weather is uncertain. There is a lot of good, interesting, and solid information here. Cox provides a summary of each chapter along with a listing of key references which shows just how detailed the research was. The summaries are probably sufficient for most readers unless you like getting in to the detail. Protecting migratory birds in an era of changing global climate will require greater understanding of the changes that are likely to occur in breeding and wintering areas, as well as in the networks of stopover areas used in migration. I like the information offered here, but I don’t think this book will appeal to many other than the most avid birders or educational environmentalists. Looking for a good book? 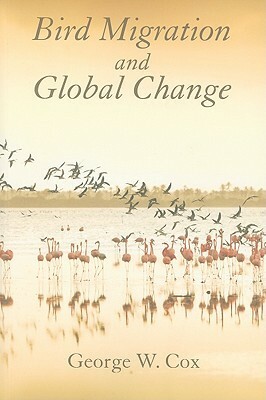 Bird Migration and Global Change by George W. Cox has some solid research but only the most avid environmentalists and birders will be willing to slog through the work to prove their concerns correct. *All quotes are from an Advanced Readers Copy and may not reflect the published book.